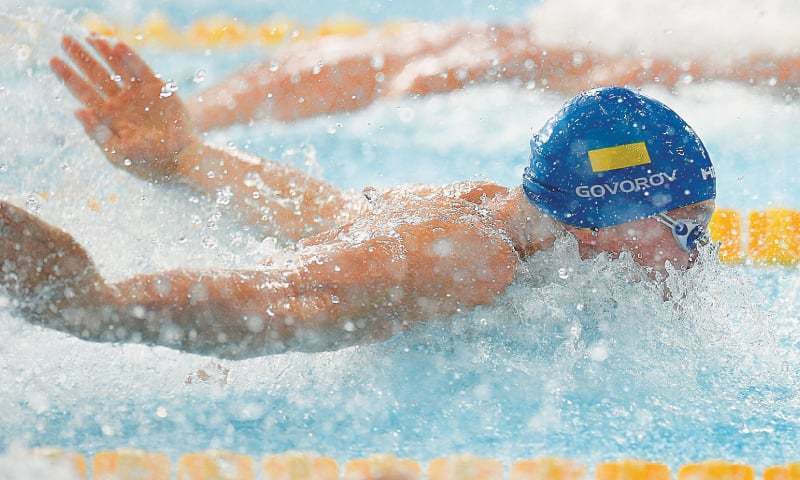 GLASGOW: Ukrainian swimmer Andriy Govorov cruised to victory in the men’s 50m butterfly at the European Championships on Tuesday, a month after he smashed the discipline’s nine-year-old world record. Italy’s Simona Quadarella eased to gold in the women’s 1,500 freestyle for her second European title after also winning the 800m freestyle. Quadarella, who was the bronze medalist at last year’s world championships, swam side-by-side with Germany’s Sarah Koehler for almost half the race but enjoyed a lead of more than 3 seconds at the 1,000m mark and ultimately beat Koehler by 6.24 seconds. In the 100m backstroke, Anastasiia Fesikova of Russia edged Britain’s Georgia Davies for the gold medal, while Olympic champion Katinka Hosszu missed the podium in fourth. On the final day of synchronised swimming, Russia’s Svetlana Kolesnichenko won both the duet free routine, teaming up with Varvara Subbotina and Anastasiia Arkhipovskaia, and the concluding solo free routine for a perfect record of four golds from four events.